Many adult and teenaged patients wonder what they’re allowed to eat when undergoing Invisalign treatment. This questions stems from the usual pitfalls associated with traditional metal braces, which require patients to make dramatic changes to their diet to accommodate the additional hardware. Luckily, that is simply not the case with Invisalign in Tulsa. If you have a professional image you need to maintain or simply don’t want to have braces during your high school years, keep reading. One of the biggest benefits of using Invisalign for orthodontic treatment is their ability to be removed. Traditional braces are not designed to be removed when shifting teeth, but clear aligners are specifically designed to do so. This is because patients need to switch to multiple pairs in a series to complete treatment. With that being said, patients don’t have to worry about changing their diet in fear of putting their orthodontic treatment or devices at risk of damage. Of course, they’ll still need to care for their aligners and stay committed to wearing them throughout the day and night. Failing to do so can cause significant interruptions, only prolonging the treatment time. Caring for your aligners means rinsing them after every removal and sanitizing them at least once a day. Even after brushing and flossing, your mouth is filled with harmful bacteria while you wear them at night. This means plaque can form on the interior and exterior of the aligners. To sanitize them, purchase either a denture cleanser or Invisalign’s own brand of cleaning crystals and allow them to soak while brushing normally. After soaking, use a soft-bristled toothbrush separate from your normal toothbrush to remove loose plaque and food particles. Avoid using toothpaste or soaps that are colored or scented to clean aligners. Removing food debris from your teeth and aligners prevents interruptions from occurring. A loose food particle can easily get in the way of your shifting teeth, causing the chances to be less accurate. For effective treatment, you’ll need to wear the aligners for at least 22 hours a day. The longer you wear them, the faster your treatment will be. If you know that you won’t be able to get to your dentist in Tulsa because of another engagement, keep your next pair of aligners on you so you don’t miss any days of treatment. 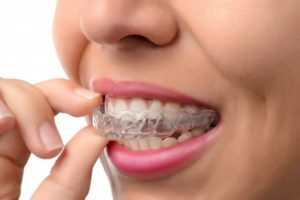 If you fear that you won’t be able to stay committed or you aren’t sure if you’ve worn the aligners long enough, Invisalign for Teens is a great solution. These aligners come with a built-in indicator that informs dentists and patients if they’ve been wearing their aligners long enough and that their teeth are getting straight. Why settle for traditional braces when Invisalign in Tulsa makes treatment easier? Schedule a consultation with your dentist today! Dr. Angie Nauman has taken many hours of continuing education since earning her dental degree. This education includes the use of multiple orthodontic treatments, including Invisalign. To learn more about straightening your smile, contact her at (918) 254-8686 or visit her website.